A new kind of Sheriff has made it to town and wants you to help him protect our casino while you chase off the bad guys! 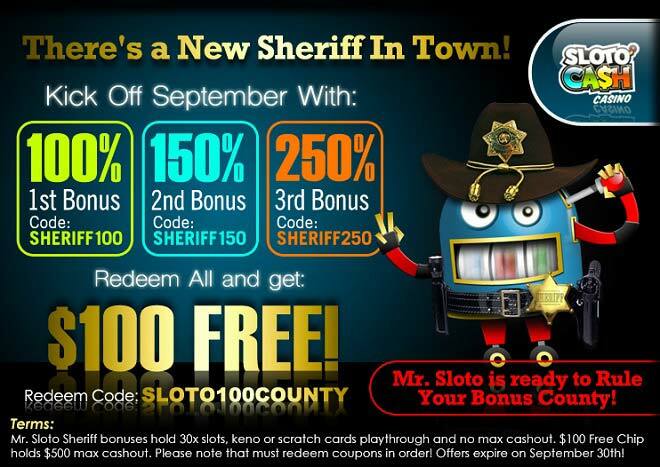 Kick off this new month with a serious bang and welcome September in the company of Mr. Sloto Sheriff as he rewards you with a 100% Bonus, followed by a 150% Match and topped off with a whooping 250% Match! And in case that wasn’t loud enough for you, for helping him save Sloto’Cash town the Sheriff has also collected an extra $100 just for you that you can redeem for FREE when you’ve claimed all three bonuses! Are you tough enough to help Mr. Sloto Sheriff lay down the law? It’s your turn to prove it as you collect a triplet of September bonuses and an extra $100 token simply for protecting Sloto’Cash from crooks, thieves and burglars!